Albert Lindon is a figure that transcends two football clubs and is paramount to the survival of professional football at Penydarren Park. He is no local. He was born in Kings Norton near Birmingham on 27th January 1891. His first clubs were the imaginatively named Birmingham Fruiterers and Delta Metal Works. Albert was a goalkeeper. In 1910 he joined his local club Birmingham City where he made 7 appearances for the St. Andrews club in the 2nd division of the Football League. The Blues had a disappointing season ending in 22nd place so our hero was on the move across the city to Villa Park where he managed one solitary game between the sticks for Aston Villa albeit in the lofty climes of the First Division. Albert frustrated by the lack of games first of all went to Barnsley and then Coventry City to seek regular games. He made 29 appearances at Highfield Road before making the decision to head to South Wales. It was in 1920 that Albert Lindon first entered Penydarren Park. Merthyr Town were inaugural members of the new Third Division of the Football League and Albert was one of the first signings for manager Harry Hadley for the Red & Greens. So it was on 28th August 1920 that Albert Lindon played in goals at our famous old ground as Crystal Palace were beaten 2-1 to notch Merthyr Town's first ever Football League victory. There were 16,927 fans there that day by the way. In 1924 the then manager Thomas Daniel Jones resigned and on 1st August Albert was appointed player-manager. His reward for accepting one of the most challenging jobs in the Football League? The princely sum of £1.00 per week on top of his playing contract. His first season wasn't a success by any imagination. Merthyr Town finished bottom of Division 3 South with only 8 wins during a desperate season. Thankfully Merthyr Town survived re-election and our inductee was able to manage the team for a further two seasons which with both club and town fighting economic decline he managed to keep the club away from further re-election lottery. All in all he made a record 250 appearances for the Football League club, he even managed to score a goal (I can't find out against who though, it was probably Newport County!). In 1927 second division Charlton Athletic swooped to sign Albert Lindon as player-manager. He had another disastrous start to his managerial career winning just one of his first eleven games and losing half of the remaining games of the season. Only the good form of the opening start of the season accounted for Chalrton's 11th place finish which at the time was their highest in their history. One of main successes was the recruitment of Dai Astley from us that year for £100.00. Dai had scored 3 goals in 5 games for Merthyr Town. Albert showed he had a great eye for a player as Dai Astley (who is included in the montage behind me on the wall) went on to score 27 goals in 96 appearances for the Addicks. The boy from the Valleys had to go to the Valley to start a career that culminated with Aston Villa and Wales. Albert Lindon's vision is central to that success. The previous manager Sandy MacFarlane returned from Dundee FC in 1928 and Albert was appointed as Assistant Manager. He went on to play 34 times for Charlton Athletic and returned to the Manager's position in 1933 when MacFarlane resigned for a second time unfortunately a gloomy six months in charge resulted in Charlton's relegation from the second division. Twelve years later Albert Lindon kick starts the reformation of the new Merthyr Tydfil FC with a stirring speech at the first public meeting on 1st March 1945. The club appoints Jock McNeil to manage the fledgling professional enterprise at Penydarren Park but when he has to resign in 1947 due to his daughter's ill-health it is Albert Lindon that is appointed to continue Jock's good work and he doesn't disappoint. He takes Merthyr Tydfil even higher. 1948 - Merthyr win the Southern League Championship for the first time. Six points clear of Gillingham. 1949 - We win the Welsh Cup for the first time with a 2-0 victory over Swansea Town at Ninian Park in front of 7,000 travelling Merthyr supporters. It's from this match that Albert has an idea that the Welsh Cup winners should play the FA Cup winners so Wolves visit Penydarrent Park for a friendly in front of 13,400 fans. However two weeks later Albert Lindon had resigned from Merthyr Town. His relationship with the Board was always prickly. His team carried on the good work and won the league that year on goal average from Colchester United. Albert Lindon died in 1976. Albert deserves to be the first inductee into the Merthyr Football Hall of Fame as his prowess covered two eras of football in Merthyr Tydfil; as a player and manager during the Football League years through to the formative and glory years of the post-war period. He was there during some of the toughest and most rewarding days at Penydarren Park. Ladies and Gentlemen please salute Albert Lindon. The recent financial issues at our beloved club have certainly focussed many of us on the realities of running a semi-professional football team in a leisure market saturated by live TV sport, Vue cinema and the many retail parks in the borough laying siege to what little expendable money we have in our Merthyr Tydfil pockets. We’ve ploughed a lone furrow for decades in the grass is greener English non-league pyramid but with a new dawn of football austerity on the horizon perhaps we need to cross the rubicon and consider plying our wares in Wales. The idea will be emotive and will almost certainly find few in agreement around Penydarren Park but this decision must be taken with the head and not the heart and be based on a sustainable future for the club and not be set due to the comfort of what we know. So how do we sustain a semi-professional football team to represent our town? And what is the purpose of our football club? 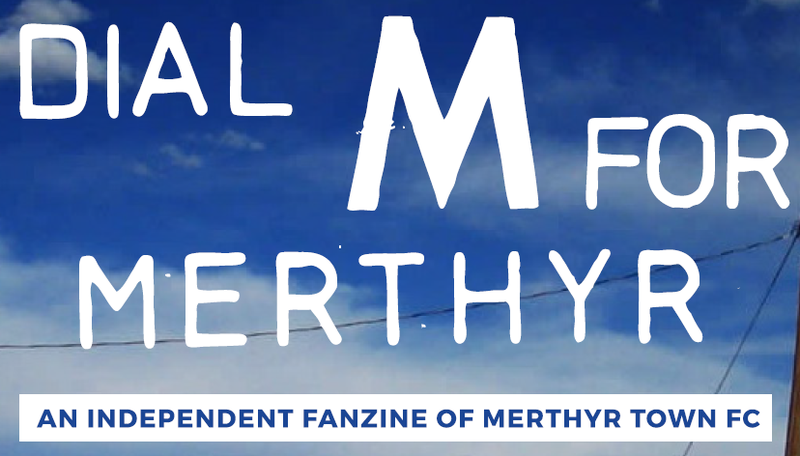 The Welsh Premier League (WPL) article in the last issue lit a very slow fuse but eventually the idea that Merthyr Town fans could debate the future of their club exploded on social media. A debate on where the Martyrs should play seemed too much for many Merthyr fans and a minority of Welsh pyramid enthusiasts never really got to grips with the fact that the FAW has never set out the criteria for any “exile” club to enter the current domestic game. Nothing of note has changed since the last fanzine was ignored on the terraces at Penydarren Park. At the AGM in February (?) there will be a motion presented to the members referring to the benefits of both Welsh and English systems and the sustainability of Merthyr Town as a competitive club in the future. It seems that the ever curious football fan has returned to following our national team home and away, you know the one I’m on about, he (and it’s always a he) needs to know where you’re from in Wales and of course more importantly who you support? We’ve covered this issue before in the fanzine. A very long evening in Vienna was endured by about twenty of our fellow Martyrs as our loyalty to our black & white heroes was called into question. You aren’t Cardiff fans? Then you must be Swansea seemed to be the logic of that Austrian adventure.